An experienced landscaper with an expert concept of form to function can help you to create the outdoor kitchen and dining area of your dreams. As you think about the meals you’ll make, think about the cooking process and the steps you’ll take to produce one of your favorite meals from start to finish. Discuss these plans with your landscape architect, who can further plan for the right flow around your home’s outdoor spaces, keeping safety and the integrity of your existing structures and surroundings in mind. Your landscaper can also draw out plans for your entire backyard spaces, leaving enough workspace and enough open space to allow you to navigate around the different kitchen components comfortably. You will also want to consider the measurements of your outdoor dining furniture and any other elements you plan to add. Build these into your blueprints as well. This can be especially useful if you are planning your landscaping in phases or if you might add on in years to come. For example, if you want to have a swimming pool, fire pit, dining area, and spa, it helps to visually depict each attraction and its individual components while visualizing the flow from one space to the next. Even if you do your own quick sketch of where you think things should go, it will ultimately help you to picture yourselves using and enjoying the outdoor space as intended. Is this our long-term dream for this outdoor living space? Do we plan to add on or change things at any given point in the future? Will any of these kitchen elements cause changes to our existing structure and landscape? What utilities (electric, gas, etc.) may be required for the different options we are considering? Are there any potential issues to consider when choosing the layout? 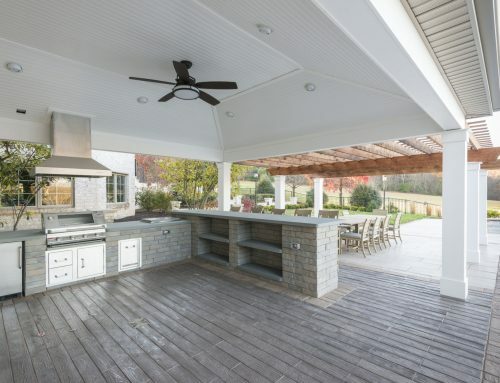 Some of the key outdoor kitchen accessories to keep on you radar include your grill, side burners or stovetop, counters and workspace, sink, fridge, mini fridge, ice chest, wine storage, wood-burning oven, and electrical outlets. You may also want to consider options for insect control and temperature control if you hope to extend your kitchen’s use into the cooler months. You may want to discuss with your landscaper whether your kitchen appliances and other components are able to be permanently placed or if they will need to be moved back and forth when the seasons change. You can build the outdoor kitchen of your dreams according to almost any budget. Be honest about your limits from the start and begin listing out your must-haves and your nice-to-haves. Consider different materials, like the real thing and those that look real but aren’t, for example, authentic stone walls surrounding your grill versus the faux stone veneers and artificial walls that look almost like the real thing. You can go down the list just as if you were remodeling your kitchen – granite or Corian, stainless steel, hardwood, bamboo and plenty of other options to consider. Can anything be upgraded later or must it all be done to spec now? Are the materials you’re considering durable and likely to last? What are the best options for the climate where you live? To give yourself a clear idea of what you really, truly want, take a look at your landscaper’s portfolio and also do a few searches online and in your favorite home improvement magazines. You might even find so many lovely outdoor kitchens that you end up with even more ideas! There’s just something amazing about cooking – and eating – in the fresh air, especially during the warmer months of the year. 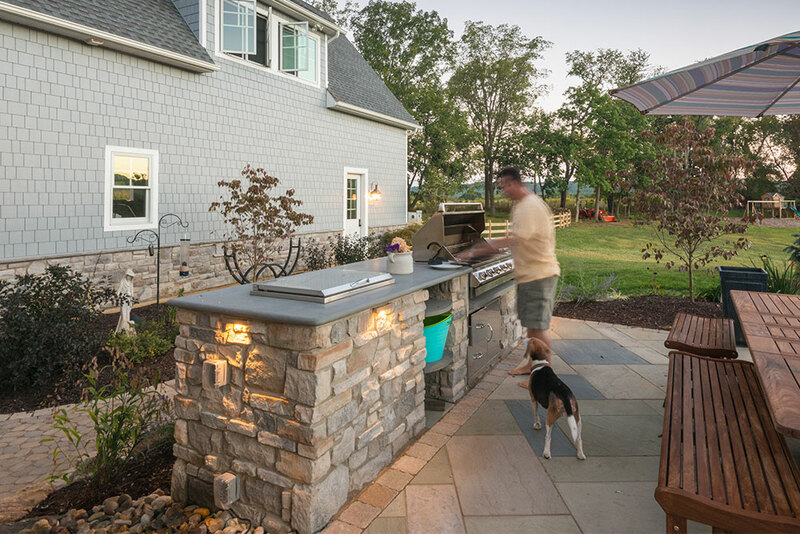 A fully loaded outdoor kitchen is just the ticket to giving you all the creative freedom you can fathom for your family meals and entertaining throughout the summer and beyond. Adding bacon to your burgers is no longer a challenge. Simple steaks and barbecue chicken dishes soon turn into gourmet style entrees with all the fixings, akin to something you’d find at your favorite summer hotspots. You suddenly find yourself grilling desserts! Eating al fresco becomes even more fun when you’re sitting in your own backyard, enjoying life in slow motion, finally.